قجاوند, حسین, نورمحمد, علیرضا. (1392). ازدیاد برداشت نفت از سنگ های کربناته به وسیله آشام خودبه‌خودی محلول های سورفکتانت. نشریه شیمی و مهندسی شیمی ایران, 32(3), 69-78. حسین قجاوند; علیرضا نورمحمد. "ازدیاد برداشت نفت از سنگ های کربناته به وسیله آشام خودبه‌خودی محلول های سورفکتانت". نشریه شیمی و مهندسی شیمی ایران, 32, 3, 1392, 69-78. قجاوند, حسین, نورمحمد, علیرضا. (1392). 'ازدیاد برداشت نفت از سنگ های کربناته به وسیله آشام خودبه‌خودی محلول های سورفکتانت', نشریه شیمی و مهندسی شیمی ایران, 32(3), pp. 69-78. قجاوند, حسین, نورمحمد, علیرضا. ازدیاد برداشت نفت از سنگ های کربناته به وسیله آشام خودبه‌خودی محلول های سورفکتانت. 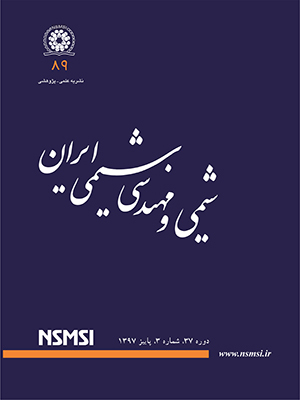 نشریه شیمی و مهندسی شیمی ایران, 1392; 32(3): 69-78. به منظور ارزیابی ترکیب ‌های فعال سطحی در تغییر ترشوندگی سنگ‌های کربناته مخازن نفت ایران برای استفاده در عملیات ازدیاد برداشت نفت، دو نمونه سورفکتانت از نوع آنیونی و کاتیونی به ترتیب سدیم دودسیل سولفات و هگزادسیل تری‌متیل آمونیوم برمید مورد آزمایش ‌های آشام قرار گرفت. بررسی تغییر ترشوندگی با محلول‌ های سورفکتانت و افزایش ضریب برداشت نفت در شرایط شبیه‌سازی شده به یک مخزن نفت در حوزه فلات قاره ایران به عنوان مخزن هدف و با استفاده از نمونه‌های سنگ و سیال مخزن مورد نظر صورت گرفت. محلول ‌های سورفکتانت با استفاده از آب تزریقی به این مخزن تهیه شد و نتیجه‌ های به دست آمده از آشام خود به خودی آنها و در نتیجه بازده برداشت نفت با نتیجه به دست آمده از بازده برداشت نفت توسط آشام آب تزریقی بدون سورفکتانت مورد مقایسه قرار گرفت. نتیجه ‌های به دست آمده نشان دهنده پتانسیل بالای سورفکتانت کاتیونی در غلظت‌ های بالای CMC در افزایش برداشت نفت به واسطه آشام خود به‌ خودی است. آشام آب شور در دمای بالای مخزن نیز منجر به بازده برداشت بالایی از نفت شد که میزان آن به تقریب معادل با بازده برداشت نفت به واسطه آشام سورفکتانت آنیونی است. نتیجه ‌های پژوهش نشان‌دهنده اهمیت توجه به پدیده آشام در مخازن نفت‌تر به ویژه در حالت شکاف‌دار می‌باشد. Standnes D.C., Austad T., Wettability Alteration in Carbonates Low-Cost Ammonium Surfactants Based on Bio-Derivatives from the Coconut Palm as Active Chemicals to Change the Wettability form Oil-Wet to Water-Wet Conditions. Colloids and Surfaces A: Physicochem. Eng. Aspects, 218, p. 161-173 (2003). Al-Hadhrami H.S., Blunt M.J., Thermally Induced Wettability Alteration to Improve Oil Recovery in Fractured Reservoirs, in: Paper SPE 59289 Presented at the SPE/DOE IOR Symposium at Tulsa, OK, April 3–5 (2000). Austad T., Matre B., Milter J., Sævereid A., Øyno L., Chemical Flooding of Oil Reservoirs: 8. Spontaneous Oil Expulsion from Oil- and Water-Wet Low Permeable Chalk Material by Imbibition of Aqueous Surfactant Solutions. Colloids and Surfaces A: Physicochem. Eng. Aspects, 137, p. 117 (1998). Chilingar G.V., Yen T.F., Some Notes on Wettability and Relative Permeability of Carbonate Rocks, Energy Sources, 7, p. 67 (1983). Zhang D.L., Liu S., Puerto M., Miller C.A., Hirasaki G.J., Wettability Alteration and Spontaneous Imbibition in Oil-Wet Carbonate Formations, J. Pet. Sci. Eng., 52, p. 213 (2006). Hirasaki G., Zhang D.L., Surface Chemistry of Oil Recovery from Fractured, Oil-Wet, Carbonate Formation, SPE J., 9(2), p. 151 (2003). Morrow N.R., Wettability and Its Effect on Oil Recovery, J. Pet. Technol., 42, p. 1476 (1990). Graue A., Viksund B.G., Baldwin B.A., Reproducible Wettability Alteration of Low-Permeable Outcrop Chalk, in: Paper SPE 39662 Presented at the SPE/DOE Improved Oil Recovery Symposium Held in Tulsa, OK, USA, 19–22 April (1998). Austad T., Milter J., Spontaneous Imbibition of Water into Low Permeable Chalk at Different Wettabilities Using Surfactants. Paper SPE 37236 Presented at the International Symposium on Oilfield Chemistry, Houston, TX, Feb. 18–21 (1997). Cuiec L., Bourbiaux B., Kalaydjian F., Oil Recovery by Imbibition in Low Permeability Chalk, Soc. Pet. Eng. Form. Eval., 9, p. 200 (1994). Downs H.H., Hoover P.D., Enhanced Oil Recovery by Wettability Alteration. Oil-Field Chemistry. Enhanced Recovery and Production Stimulation. In: Borchardt, J.K., Yen, T.F. (Eds. ), "ACS Symposium Series", 396, Washington, DC (1989). Jadhunandan P.P., Morrow N.R., Spontaneous Imbibition of Water by Crude Oilrbrinerrock Systems. In Situ, 15, p. 319 (1991). Standnes D.C., Austad T., Wettability Alteration in Chalk: 1. Preparation of Core Material, J. Pet. Sci. Eng., 28, p. 111 (2000). Standnes D.C., Austad T., Wettability Alteration in Chalk: 2. Mechanism for Wettability Alteration from Oil-Wet to Water-Wet Using Surfactants, J. Pet. Sci. Eng., 28, p. 123 (2000). Thiebot B., Barroux C., Bouvier L., Heugas O., Plazanet V., Improvement of Imbibition Oil Recovery from Chalky Fractured Reservoirs by Additives, Presented at: The Third North Sea Chalk Symposium, Copenhagen, Denmark (1990). Thomas L.K., Dixon T.N., Evans C.E., Vienot M.E., Ekofisk Waterflood Pilot, J. Pet. Technol. Trans., AIME 283, p. 221 (1987). Torsæter O., An Experimental Study of Water Imbibition in Chalk from the Ekofisk Field. Paper SPE/DOE 12688 Presented at the 4th Symposium on EOR, Tulsa, OK, April 15–18 (1984). Strand S., Standnes D.C., Austad T., Spontaneous Imbibition of Aqueous Surfactant Solutions into Neutral to Oil-Wet Carbonate Cores: Effects of Brine Salinity and Composition, Energy Fuels, 17, p. 1133 (2003). Høgnesen E.J., Standnes D.C., Austad T., Scaling Spontaneous imbibition of Aqueous Surfactant Solution into Preferential Oil-Wet Carbonates, Energy Fuels, 18, p. 1665 (2004). Austad T., Strand S., Høgnesen E.J., Zhang P., Seawater as IOR Fluid in Fractured Chalk, in: Paper SPE 93000 Presented at the SPE International Symposium on Oilfield Chemistry Held in Houston, Texas, USA, 2–4 (2005). Spinler E.A., Baldwin B.A., Surfactant Induced Wettability Alteration in Porous Media, in: L. Schramm (Ed. ), "Surfactants Fundamentals and Applications in the Petroleum Industry", Cambridge University Press, pp. 159–202 (2000). IP 143/90 or ASTM D3279-90. Asphaltene (Heptane Insolubles) in Petroleum products, in: "Standards for Petroleum and its Products", pp. 143.1-143.7, Institute of Petroleum, London, UK, (1985). Anderson W.G., Wettability Literature Survey - Part 1.Rockroilrbrine Interactions and Effects of Core Handling on Wettability, J. Pet. Technol., Trans., AIME 281, p. 1125 (1986). Buckley J.S., "Mechanisms and Consequences of Wettability Alteration by Crude Oils", PhD Thesis, Dept. of Petr. Eng., Heriot-Watt University. Edinburgh, UK (1996). Graue A., Tonheim E., Baldwin B., Control and Alteration of Wettability in Low-Permeability Chalk. Paper Presented at: The 3rd Int’l. Symp. on Evaluation of Reservoir Wettability and Its Effect on Oil Recovery, Laramie, WY, Sept. 21–23 (1994). Milter J., "Improved Oil Recovery in Chalk. Spontaneous Imbibition Affected by Wettability, Rock Framework and Interfacial Tension", DSc Thesis, Dept. of Chemistry, University of Bergen, Norway (1996). Zhou X., Torsæter O., Xie X., Morrow N.R., The Effect of Crude-Oil Aging Time and Temperature on the Rate of Water Imbibition and Long-Term Recovery by Imbibition, SPEFE, 10(4), p. 259 (1995). Rao D.N., Wettability Effects in Thermal Recovery Operations, SPE Reservoir Evaluation and Engineering, 2 (5), p. 420 (1999). Tang G., Kovscek A.R., An Experimental Investigation of the Effect of Temperature on Recovery of Heavy-Oil from Diatomite, SPE Journal, 9(1), p. 63 (2004). Zhang P. Austad T., Wettability and Oil Recovery from Carbonates: Effect of Temprature and Potential Determining Ions, Colloids and Surfaces A-Physicochemical and Engineering Aspects, 279, p. 179 (2006).